With over 60 years of industry experience, Hawthorne Cat provides quality service and solutions you can count on. Hawthorne Cat, the exclusive Cat® equipment dealer in San Diego, the Hawaiian Islands and the Pacific Region, announces new financing offers for the summer season. Purchase a new Cat machine by September 30, 2017 and receive 1.9% financing for 72 months or 0% financing for 48 months. The offer also includes a complimentary equipment protection plan. 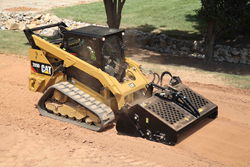 Eligible machines for the 3 year/1,500 hour powertrain and hydraulics equipment protection plan include Skid Steer Loaders, Multi Terrain Loaders, Compact Track Loaders, Compact Wheel Loaders, and Mini Hydraulic Excavators. An extended 3 year/3,000 hour powertrain and hydraulics equipment protection plan is available for Backhoe Loaders, Small Wheel Loaders, Small Track-Type Tractors, and Telehandlers.